We were in a rush to cook something quickly before going Rock’n’Roll dancing and I realised when we got home that I was pretty much one ingredient short on almost all the recipes I wanted to make. Fortunately I had all the ingredients for this – Roasted Parsnips and Sweet Potatoes. Unfortunately I didn’t have enough time to make it – so I had a choice – go dancing and not eat – or eat and not go dancing. Dancing won the day ! And it’s good we went everything seemed to fall into place and we started getting the moves right. Superwoman’s, flat hand pushes, and ‘the ladies rest’ all seemed to come together beautifully. Happy days. Now we have three moves – the sky’s the limit! We got home around 11pm and I resumed the cooking – and finished it this morning – so we’re having it for lunch today. Essentially you roast some parsnips, red onions and sweet potatoes in garlic, rosemary and thyme and towards the end throw in some cherry tomatoes. 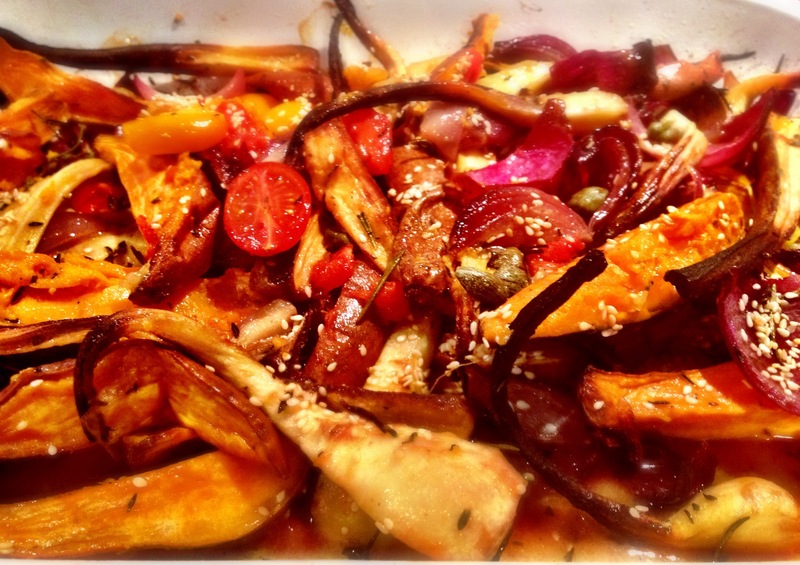 After a 90 minutes roast (from start to finish) you dress the roasted vegetables in lemon juice, olive oil and capers. It’s very easy – just takes time in the oven. Even the prep is easy as you don’t even need to peel the vegetables! If you were a roast dinners kind of person this would be a very nice twist on some otherwise plainly roasted vegetables. I think it is a great dish in its own right – the lemon juice and capers really brings a whole new flavour to the vegetables. You really can’t go wrong with Ottolenghi. This entry was posted in Plenty, Vegetarian, Want to make again, Yotam Ottolenghi and tagged food, ottolenghi, recipe, vegetarian by tenuoustoaster. Bookmark the permalink. This was my very first Ottolenghi recipe after I bought “Plenty” and I loved it. The caper vinaigrette at the end elevates the entire dish! He is an artist, that Ottolenghi. Your photo of the dish is mouthwatering!